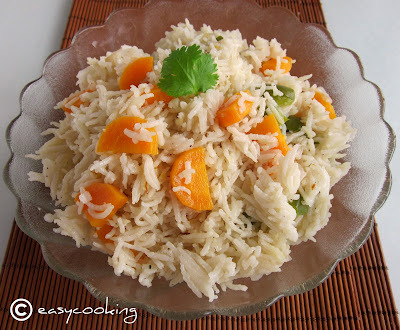 Easycooking: Vegetable Ghee Rice..a perfect one-pot meal!! Sometimes I am full of energy..cooking up dishes like there's no tomorrow,cleaning the house till it is squeaky clean and dusting,again like there's no tomorrow.But sometimes,the devil takes over and I'll become the laziest person you'd ever come across.Everything becomes a task,even making a cup of coffee to uplift my mood.Combine this with a weekend stay at the in-laws place with an array of yummy dishes plus another weekend with family around combined with lots of outing,shopping and eating out.Could I be blamed if I become lazy?? Thanks to our little chat,Madhuri assured me I am not alone in this.We even named this a Food Blogger Inactivity Virus,cool no? ?When a syndrome takes responsibility for our laziness? ?However,while discussing about food - what else,I told her about the lunch I was making.Though the name sounds all fancy,it was my little trick to escape making rice with a curry and a stir fry to go along. This one almost did not make it to the blog,but for a push from her asking me to make it for the advantage of similar minded lazy bums.Mads,thanks--the push worked!! I assure you,this one is truly a one-pot meal.Originally a recipe for Ghee rice,I added some carrots and capsicum to make it look like a Vegetable Ghee rice,less work-more tasty! !You could add any vegetable of choice or make it plain. In a pressure pan/cooker add the ghee and roast the whole spices for a minute. Add the onions and roast till they slightly start changing the colour. Mix in the carrots and capsicum and give a good stir. Drain the soaked rice and add. Stir well till everything is mixed. Add the water and enough salt to taste and let it come to a boil. Close with the cooker lid and cook for 2-3 whistles. Let the cooker come to room temperature-open and fluff with a fork. Lovely clicks , Divya. The rice looks fluffy and comforting. Pretty fast to cook, might make on any lazy day. looks so so so tempting and perfect.. thanks for the recipe dear !! I have been wondering what has affected me since last couple of weeks... Thanks for enlightening me, now I know its the 'Food Blogger Inactivity Virus'!!! the rice with veggies look so good. A healthy way to getting children to eat veggies. simple lovely and tasty rice. love one meal...looks yummy and very inviting!! wow, that looks beautiful !!! Loving the veg ghee rice :)!..true! a nourishing one pot meal!.. Adding veggies sounds yummy n colourful, delicious ghee rice..